Fill in a form and a card will be posted to you, 20 points are already on the card when you apply. This all sounds good in theory but we were better off with immediate discount on purchases, but it's better than nothing. I used to buy the wood from the shop at the top of Rookery Lane opposite Brant Rd he even used to mitre it for me, I think the shop is still there. MaryB has asked if anyone knows where she can buy wood to make picture frames. We'll be at Bailgate from 7pm on Thursday for another LP Workshop for those of you who would like to come along. There'll be more techniques for you to try and ideas for taking your designs forward. For those of you who haven't experienced this event - you really should! It's not just for quilters. It's at the NEC near Birmingham (only 2 hours drive from Lincoln, and easy to find) and starts on Thursday this week (runs until Sunday). There's over a 1000 quilts to see, many of them art quilts which wouldn't look out of place in an embroidery exhibition. The traders will be there too - many of whom you'll already know. But you won't find cross stitch or card-making stands. The next Stitch Club is on Saturday 18th August with Christine Plummer. We'll be making bags using strips of fabric woven into incorporate lace, ribbons which will be hand or machine stitched before making up into a bag. Heather prepared a project for us to do. We were each given a letter and a piece of felt to stitch. The letters will be painted and assembled later to produce a banner for Lincoln Bailgate. Look out for it in a later blog. The bring & buy raised lots of cash for the Luttrell Psalter project - we'll be having a sales table at branch meetings from now on. Now we're looking for another garden for next year ..... any volunteers? The Bailgate Garden Party is at Dee's in Ingham this year - starts at 2pm. I do hope the weather holds up. It's been so nice this week after all the rain we've had. I am looking forward to a nice, relaxing afternoon. Bring a chair and a sewing kit. In the July 25 issue of thisisthebusiness, a colleague wrote about a new patchwork/sewing shop in Ruskington. It is run by Zambian-born Debby Scarff. I haven't been to see her, but she has quilts on display and sells quilting and embroidery stuff, as well as batik goods direct from Bali. Perhaps members would like to know of her existence. They can find her shop at 31 High Street, Ruskington....her telephone number is 01526 830210, in case anyone wants to check what she stocks. I've been reading a lot about Moonshadow Mist and decided I must have some, if anyone else must have some the best price I could find was on qvcuk, if you havn't heard about them I think they are similar to walnut inks but some fantastic colours, really get some good effects with them. I've been into Mansfield today 2/8 to Sally Twinkles and discovered that Miss Twinkle died in February. The shop has been under threat of closure but the staff now understand that a buyer has been found and all will remain the same. Which is a huge relief as reasonable fabric suppliers in this area are few and far between. Mary's found some good offers for thread on www.sewdiscounted.co.uk. They sell a wide range of threads, fabrics and accessories for hand embroidery, plus cross stitch kits. They have offers on Kreinik and Rainbow Gallery brands. 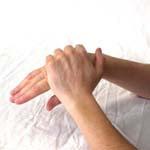 It's a self-massage technique for your hands, arms and neck. Mary's tried it and says it seems to help. Our hands and arms are the most important tools we have, so we need to look after them. It's a new on-line magazine that is being launched at the end of August. Will be covering mixed media techniques including paper, fabric and stitch. There's some interesting free projects to get you started! John Governale has scanned all 255 pages of an 1886 J. F. Ingalls catalog of embroidery stamping patterns and placed the scans in the public domain. You can download them for free. Worth a look. They're large images and there's no thumbnails, so they make take a while to download if you don't have broadband. Those of you making bonnets may find something suitable for the brim. Here are some photos from the workshop - can't believe how different they all are!